Finding solutions to the entangled problems of human population growth, resource exploitation, ecosystem degradation, and biodiversity loss is considered humanity's grand challenge. Small and isolated societies of the past, such as the Rapanui of Easter Island, constitute ideal laboratories for understanding the consequences of human-driven environmental degradation and associated crises. By integrating different processes into a coherent and quantitative framework, mathematical models can be effective tools for investigating the ecological and socioeconomic history of these ancient civilizations. Most models of Easter Island are grounded around the Malthusian theory of population growth and designed as Lotka-Volterra predator-prey systems. Within ranges of plausible parameter values, these dynamic systems models predict a population overshoot and collapse sequence, in line with the ecocidal view about the Rapanui. With new archaeological evidence coming to light, casting doubts on the classical narrative of a human-induced collapse, models have begun to incorporate the new pieces of evidence and started to describe a more complex historical ecology, in line with the view of a resilient society that suffered genocide after the contact with Europeans. Uncertainties affecting the archaeological evidence contribute to the formulation of contradictory narratives. Surprisingly, no agent-based models have been applied to Easter Island. I argue that these tools offer appealing possibilities for overcoming the limits of dynamic systems models and the uncertainties in the available archaeological data. Only a few years ago, humanity reached a new demographic milestone, the birth of the Earth's seventh-billion resident. Demographers have not been alone in expressing concern that with the population expected to reach 9 billion by the middle of this century, Earth's ability to feed and provide other necessities for human life will soon be surpassed. The collapse of historical societies has attracted the attention of both ecologists and economists in relation to current issues of population growth, environmental degradation, and sustainability. A large body of literature, popularized by Jared Diamond in his bestselling book Collapse (Diamond, 2005), argues that ancient civilizations such as the Maya of Mesoamerica, the Anasazi of the southwest United States, the Norse of Greenland, and the Rapanui of Easter Island, collapsed because they degraded the environment or overexploited the ecological resources sustaining them. This field of research has generated an emerging modeling literature focusing on human-resource interactions. Most of the modeling studies are grounded around the Malthusian theory of population growth (Malthus, 1798) and designed as Lotka-Volterra predator-prey systems, in which the human population is the predator and the resource is the prey. The Malthusian theory postulates that over time population growth tends to outrun food supply locking humans into a trap characterized by environmental degradation and overexploitation and leading to a collapse of the human-resource system. Among all potential cases of historical collapse, Easter Island is probably the most attractive because it constitutes a sort of natural laboratory of the past, due to its small size and isolation (Figure 1). Figure 1. 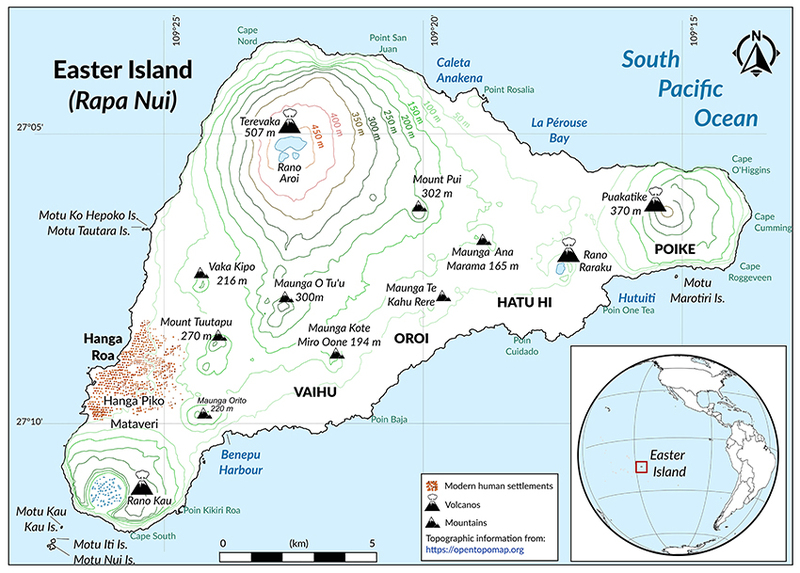 Geography of Easter Island and its location (inset) in the South Pacific. The small size, about 165 km2, and isolation make the island a natural laboratory for studying past human-resource interactions. Map courtesy of Jailson Fulgencio de Moura. Modeling studies on Easter Island, which started to emerge approximately two decades ago with the pioneering work of Brander and Taylor (1998), are not very numerous and could be covered, at least briefly, by a short review such as the present one. Therefore, my aims are to survey the existing literature on models of Easter Island (comprising some 30 articles), critically review the advances made over the last two decades, point out the existing gaps, and provide an outlook on where we could direct our attention in the future. The rest of this article covers these aspects as follows. The next two sections briefly describe modeling studies focused, respectively, on socioeconomic aspects and on ecological aspects. Although, as we shall see, the line separating these two kind of studies may be a thin one. After these descriptions, I will highlight gaps in our approaches and current knowledge and will suggest possible areas for future research efforts. I will conclude in the final section by summarizing the main points. Some years ago, Reuveny (2012) conducted a very insightful analysis of the literature on the collapse of historical civilizations from a resource economics modeling perspective. Considering Easter Island the best example for studying collapse, due to its isolation and its potential for responding with innovations, institutions, and conflict, Reuveny (2012) centred his attention on models applied to the Rapanui society. To avoid unnecessary repetitions here I will present these studies only very briefly and qualitatively (i.e., without describing equations), and I will refer the reader to Reuveny's (2012) review for further details. I will complement the list of articles discussed by Reuveny (2012) with the latest publications in the field. Reuveny (2012) subdivided the literature into two major types of studies: (1) those assuming a myopic resource extraction (i.e., agents do not maximize utility across multiple time periods but instead focus on the given period) and (2) those based on farsighted decision making. The earliest and most representative modeling study based on a myopic resource extraction assumption (one that satisfies many proponents of the ecocidal view of the ancient Rapanui people, e.g., Flenley and Bahn, 2003; Diamond, 2005) is that of Brander and Taylor (1998). Brander and Taylor (1998) considered a resource stock, represented by a forest-soil complex, increasing logistically and decreasing linearly due to harvest. The economy produced and consumed two goods, the resource harvested and some manufactured good. Labor was the only other factor of production, which was assumed equal to population size. Harvest was simulated with a Schaefer function depending on resource and population levels and manufacturing on population levels only. This model could reproduce a boom and bust cycle in human population, peaking at about 10,000 individuals around 1250 AD and falling to 3,800 by the year 1850, in line with the understanding of the island's history at that time. Given the model assumptions, they concluded that the ancient Rapanui collapsed because they were myopic, lacked understanding of the forest-soil complex, and experienced increase growth with resource consumption. They also argued that resource depletion might have gone unnoticed because the forest disappeared relatively slowly compared to the typical 30-year life span in prehistoric Polynesia, although later studies suggested that about 40 % of the Rapanui lived between 40 and 55 years (Shaw, 2000; Hunt and Lipo, 2001). The model of Brander and Taylor (1998) has been refined in a number of ways. Anderies (2000) added a minimum resource consumption per capita to capture the end of monument carving at around 1500 AD. Erickson and Gowdy (2000) included a capital stock, accumulating by a full conversion of the extracted resource into manufacturing of tools and boats and depreciating at a constant rate. Also Roman et al. (2017) included a capital stock produced from extracting natural resources but in addition explored the effects of movements of people and goods between two hypothetical societies sharing the characteristics of Easter Island. Matsumoto (2002) considered a discretized version of the time-continuous Brander and Taylor's (1998) model to investigate the sensitivity of the model dynamics to changes in time-dependent parameters. D'Alessandro (2007) considered two resources, forest and land area, and included a threshold in resource level below which exhaustion became inevitable. Taylor (2009) also included a threshold in resource stock. Other models have considered the possibility for social adaptation either through negative changes, for example via conflict (Reuveny and Maxwell, 2001; Maxwell and Reuveny, 2005; Reuveny et al., 2011) or rivalry (de la Croix and Dottori, 2008), or through positive changes, for example by technical progress (Reuveny and Decker, 2000; Decker and Reuveny, 2005; Dalton et al., 2005), by forming resource management institutions (Dalton and Coats, 2000; Erickson and Gowdy, 2000; Pezzey and Anderies, 2003; Taylor, 2009; Chu et al., 2014), or by introducing economic stratification in the form of elites, commoners, and wealth accumulation (Motesharrei et al., 2014). All these modeling studies showed that a collapse was inevitable unless the population growth was sufficiently slow or resource renewal rate was sufficiently fast. Models based on foresight, (i.e., models simulating a population who cares about its future, a premise consistent with the genocidal view on the fate of the Rapanui, e.g., Peiser, 2005; Hunt, 2007; Hunt and Lipo, 2011), are only a few. Among them, the work of Good and Reuveny (2006) is probably the most prominent and the first applied to Easter Island. They showed that even if the islanders had complete assignment of property rights and implemented optimal resource management with infinite horizon, or equivalently had a social planner that implemented such an optimal plan, a similar boom and bust cycle obtained by Brander and Taylor's (1998) model would have occurred. This work was expanded a few years later by the same authors (Good and Reuveny, 2009) with the inclusion of social welfare functions to confirm that these best-case institutions would have done little to prevent the social collapse of the Rapanui. As for studies focused on ecological aspects, I will consider those based on models that do not entirely follow the orthodox resource economics approach, which typically structures models to capture a small, closed economy represented by a renewable resource and human labor producing different types of goods (e.g., harvested and manufactured goods). I will therefore focus on models in which a population of assumed identical agents harvests from a resource assumed to follow a logistic growth function, without much considerations of economical nature. This distinction may appear minimal, but it can lead to substantial differences in the way these two classes of models can be further developed and applied. A model with such an ecologically-centred flavor is that of Basener and Ross (2005). Much in line with the results of models embedded into resource economics principles, Basener and Ross (2005) found that when the harvest rate was faster relative to the rate at which the resource renewed itself, a boom and bust cycle occurred. Alternatively, population and resource coexisted, when the harvest rate was slower than the resource regeneration rate. In a subsequent study, Basener et al. (2008) further developed their model to include a rat population that ate palm seeds, in accordance with the hypothesis advanced by Hunt (2007) asserting that the rats could have been the primary cause of the forest decline. Their modeling work confirmed Hunt's (2007) hypothesis. Bologna and Flores (2008) developed a model very similar to the one of Basener and Ross (2005) with the difference that the original harvest rate is now called deforestation rate and is defined by the ratio between the capability of exploiting the resource and the capability of the resource to regenerate itself. They thus reproduced the conditions that lead to a collapse. Wolcott and Conrad (2011), developed two models: a two-state variable model of human population and resource, and a three-state variable model of human population, resource, and agriculture. They showed that the three-state model reduced to the two-state model and produced dynamics that were consistent with the history of Easter Island. Basener et al. (2011) created a spatially-explicit version of their previous model (Basener et al., 2008) by including a reaction-diffusion scheme to capture movements of people and rats within the island. They showed that by increasing the mobility of the rats the model shifted from a stable equilibrium, characterized by the coexistence of people, rats and forest, to an unstable equilibrium, driving the populations to a collapse. Takács et al. (2016) took Basener et al. (2011)'s spatial model, introduced a diffusion parameter for tree, and showed that this had a stabilizing effect on the model system. Finally, Brandt and Merico (2015) developed a modified version of (Basener et al., 2008)'s model and included an epidemic component comprising susceptible, infected, and recovered individuals to capture the effects of the diseases introduced by Europeans. Rather than trying to predict the classical collapse, Brandt and Merico (2015) used the model to test the plausibility of the two main competing hypothesis, collapse (ecocide) and long-term resilience with a fall at the time of the European contacts due to diseases (genocide). In addition, Brandt and Merico (2015) suggested and tested a third scenario, a long and slow demise. While none of the three scenarios could be completely ruled out, the slow demise appeared to be the most plausible when compared to the temporal pattern of deforestation inferred from the latest compilations of radiocarbon dates on charcoal remains (Hunt and Lipo, 2006; Mulrooney, 2013). The model could reproduce the three scenarios fairly easily. This was surprising especially because only a few parameters (seven, excluding those relevant to the epidemic module, which was activated after 1722 AD) needed to be adjusted within reasonably small ranges to reproduce the different scenarios. In a way, this model result mirrors the controversy between scholars and demonstrates how uncertainties in the assumptions (i.e., the parameter values from a modeling perspective) can lead to very conflicting views. With new archaeological evidence coming to light, casting doubts on the classical narrative of a human-induced collapse, some of these models have begun to incorporate the new pieces of evidence and started to describe a more complex historical ecology. None of the studies presented provided an operational definition of collapse. The problem seems to be widespread over the broad literature on human-resource interactions (Tainter, 2006). Authors assume probably that the meaning is obvious, without concerns for individual, cultural, or temporal variation (Tainter, 2006). By considering economic reasons an important determinant of the fall of historical societies, Tainter (1988) defined collapse as a phenomenon according to which a society “displays a rapid, significant loss of an established level of socio-political complexity.” Diamond (2005), instead, gave priority to the population: “By collapse, I mean a drastic decrease in human population size and/or political/economic/social complexity, over a considerable area, for an extended time.” A definition of collapse should be the starting point in a modeling exercise that aims at reproducing such process, if only to avoid equivocal interpretations concerning the nature and characteristics of the event in question. Most of the models presented have been developed around the premise that Easter Island was first colonized sometime between 400 and 800 AD and that a collapse occurred sometime between 1,200 and 1,500 AD. However, the time of first colonization remains contentious, with more recent studies suggesting 1,200 AD (Hunt and Lipo, 2006; Wilmshurst et al., 2011), and a fierce debate has erupted on the dynamics and consequences of deforestation (Diamond, 2007; Flenley and Bahn, 2007; Hunt and Lipo, 2007, 2009). Currently, population estimates are based either on indirect evidence (e.g., fossil pollen analysis producing deforestation patterns) or conceptual reconstructions (based on historical demographic arguments) with very contrasting results. But models depend critically on this information. Two contrasting narratives have been developed. That of Flenley and Bahn (2003) and Diamond (2005), contemplating a human population overshoot reaching between 10,000 and 15,000 individuals and followed by a collapse; and that of Hunt (2007), contemplating an initial increase, up to 4,000 individuals, followed by a plateau. Flenley and Bahn (2003) use forest fossil pollen data to reconstruct hypothetical changes in population size assuming a relationship between human population change and forest vegetation/ecosystem change. Later, Cole and Flenley (2008) admitted that this assumed relationship between human population change and forest vegetation was probably overly simplistic because “we still know very little about the way forest vegetation and ecosystems contribute to human population change.” Hunt (2007 see Figure 14) use a 3 % human population growth based on qualitative assessments of the population dynamics of hunters and gatherers of the Pleistocene (Birdsell, 1957), but it is not clear what kind of evidence on Easter Island would suggest a plateau at 4,000 individuals. I am not contesting here the notion of a profound and dramatic ecological transformation of the Island with deforestation and associated extinctions, the evidence in this respect is clear and undisputed. I am rather raising a note of caution about the idea of a collapse on Easter Island as a population overshoot followed by an abrupt societal and ecological failure because of the unavoidable uncertainties affecting the archaeological method. All these archaeological and modeling studies have contributed tremendously to our understanding of human-resource interactions in general and of Easter Island history in particular. But the ongoing, fervid scientific debate, by highlighting strengths and weaknesses in each narrative, suggests that the available evidence is at least contradictory. Although being critically important for modeling, estimates about the timing of first colonization and about the population dynamics remain among the most controversial aspects. If the hypotheses of a late colonization (Hunt and Lipo, 2006) and of a steady population at around 4,000 individuals (Hunt, 2007) are proved correct, all the modeling applications based on the abrupt collapse narrative will turn out to be spectacularly ill-posed. Despite the occurrence of droughts and other adverse climatic events have been proposed in the past by various authors (McCall, 1993; Hunter-Anderson, 1998; Nunn, 2000), anthropogenic activities have been traditionally considered the major drivers of ecological change on Easter Island. This tendency has been supported by a study of climate variability focused in the period 800 – 1,750 AD (Junk and Claussen, 2011). An analysis of global climate model results, consisting of 30-year running means of near-surface air temperature, precipitation, and Niño3.4 index (an index used to classify El Niño Southern Oscillation conditions), lead Junk and Claussen (2011) to conclude that the region of Easter Island has not been affected by significant climatic changes during pre-industrial times. A recent study (Rull, 2016), however, brought again the attention on climate. On the base of newest paleoecological data obtained from analysis of peats and lake sediments, Rull (2016) proposed that a major change on Easter Island occurred due to a combination of climatic, ecological, and anthropogenic drivers. The climatic events involved the Rano Raraku catchment (located in the eastern part of the Island, Figure 1), which supported intense cultural activities in a forested landscape and a freshwater lake until 1,450 AD. A period of intense drought during the Little Ice Age, Rull (2016) suggested, transformed the basin into a wasteland depleted of freshwater, leading to social and ecological crises and to the cessation of the carving activities. The role of climate and its effects (e.g., reduction of rainfall, drying out of basin catchments, vegetations shifts, etc.) on human-resource interactions appears to be underexplored and could be a valuable avenue of research in future modeling studies of Easter Island. The assumptions of a myopic society and of environmental changes too slow to be noticed are also problematic, especially in the light of a society engaged in sophisticated projects such as carving and moving large statues. To facilitate water permeability, limit evaporation, and create moist conditions, the Rapanui covered lands with scattered lithic mulch. They most likely collected and stored rainwater, built stone dams across streams to divert water to their fields, and expanded land for agriculture (Van Tilburg, 1994; Wozniak, 2001; Stevenson et al., 2006). Unfortunately, only a few modeling studies have been undertaken so far around the notion of foresight. These dynamic systems models showed that the Rapanui could have collapsed even if they were farsighted. However, the level of abstraction typical of these models does not allow to capture the complexity and heterogeneity of people's preferences and production technologies, even in a small world such as Easter Island. In this respect, alternative modeling techniques such as Agent-Based Modeling (ABM) offer intriguing possibilities for overcoming the mentioned limitations. Surprisingly, no ABM techniques have been considered so far to analyse the social-ecological history of Easter Island, although this approach has a relatively rich history of applications in human-resource interactions (Bousquet and Le Page, 2004) and was applied to study the growth and collapse of the Anasazi civilization (Axtell et al., 2002). ABMs not only allow hypotheses to be tested, but they can also allow counterfactual scenarios about human-environment interactions to be explored (Perry et al., 2016), which may significantly advance our understanding of the processes that took place on Easter Island. By emulating the behaviors of many heterogeneous agents interacting over and with an historical environment coded on a digitized map, ABM can potentially provide more realistic conditions and hopefully better insights into the complexity of the social-ecological microcosm of the Island. For example, by linking biological responses to heterogeneity and variability in the physical environment, ABMs could help testing the role that climatic events, such as the drying out of the Rano Raraku catchment (Rull, 2016), might have played on the Island. ABM could also be a more effective alternative to the diffusion models of Basener et al. (2011) and Takács et al. (2016), who tried to account for the movements of people, rats, and trees using a reaction-diffusion scheme. For example, ABM can account for a spatially-explicit background of location and intensity of agricultural practice and could thus provide better predictions on the size of a population that agriculture could have sustained. Recent studies such as those of Stevenson et al. (2015) and Louwagie et al. (2006), respectively, on regional land use and on the evaluation of land suitability for agricultural production, provide valuable data for constraining such a modeling application. Some ideas about potential ABM applications have been presented by Edmonds (2015), who proposed that to fully reflect the dynamics and complexity of real ecologies one needs to have a multi-agent model concerning human decision-making and social interaction combined with an individual-based model of an ecology. Scholars are divided into two opposing factions. A larger group supporting the notion of a collapse based on the early, classical archaeological and anthropological studies and a smaller group supporting the notion of a steady population size with the involvement of rats in the deforestation process based on most recent archaeological evidence. Modeling studies have been following these two different school of thoughts in a chronological manner. Early modeling applications were embedded into the notion of collapse. As recent studies proposing a later colonization and a resilient response of the Rapanui society to declining resources emerged, models have started to include elements of this new narrative, contributing to the description of a more complex ecological history for the island. Agent-Based Models offer appealing possibilities for overcoming the limits of both dynamic systems models and available archaeological data, for example, through the systematic analyses of alternative scenarios. Experiments with different agents' characteristics, their interactions, and features of the landscape would produce a variety of behavioral responses to social relationships and environmental forcing. Such investigations could provide valuable insights into arguably some the most intriguing and debated events of recent human history. This study has been supported by the Leibniz Centre for Tropical Marine Research in Bremen, Germany. I am grateful to Elisabetta Gargioni and Jacopo dal Corso for their critical reading of the manuscript. Basener, W., Brooks, B., Radin, M., and Wiandt, T. (2008). Rat instigated human population collapse on Easter Island. Nonlinear Dyna. Psychol. Life Sci. 12, 227–240. Basener, W., Brooks, B., Radin, M., and Wiandt, T. (2011). Spatial effects and turing instabilities in the invasive species model. Nonlinear Dyn. Psychol. Life Sci. 15, 455. Brander, J., and Taylor, M. (1998). The simple economics of Easter Island: a Ricardo-Malthus model of renewable resource use. Am. Econ. Rev. 88, 119–138. Diamond, J. (2005). Collapse: How Societies Choose to Fail or Succeed. London: Penguin. Flenley, J., and Bahn, P. (2007). Conflicting views of easter island. Rapa Nui J. 21, 11–13. Flenley, J., and Bahn, P. G. (2003). The Enigmas of Easter Island. Oxford: Oxford University Press. Hunt, T., and Lipo, C. (2007). Chronology, deforestation, and collapse: evidence vs. faith in Rapa Nui prehistory. Rapa Nui J. 21, 85–97. Hunt, T., and Lipo, C. (2011). The Statues That Walked: Unraveling the Mystery of Easter Island. New York, NY: Free Press. Hunt, T. L., and Lipo, C. P. (2001). “Cultural elaboration and environmental uncertainty in Polynesia,” in Pacific 2000: Proceedings of the Fifth International Conference on Easter Island and the Pacific, eds C. M. Stevenson, G. Lee, and F. J. Morin (Los Osos, CA: Easter Island Foundation), 103–115. Hunter-Anderson, R. L. (1998). “Human vs. climatic impacts at Rapa Nui: Did the people really cut down all those trees?” in Easter Island in Pacific Context. Proceedings of the Fourth International Conference on Easter Island and East Polynesia, eds C. M. Stevenson, G. Lee, and F. J. Morin (Los Osos, CA: Easter Island Foundation), 85–99. McCall, G. (1993). Little ice age, some speculations for Rapanui. Rapa Nui J. 7, 65–70. Malthus, T. R. (1798). An Essay on the Principle of Population, As It Affects the Future Improvement of Society: With Remarks on the Speculations of Mr. Godwin, Mr. Condorcet, and Other Writers, 1st Edn. London: J. Johnson. Shaw, L. (2000). “Human burials: the coastal caves of Easter Island,” in Easter Island Archaeology: Research on Early Rapanui Culture, eds C. M. Stevenson and W. Ayres (Los Osos, CA: Easter Island Foundation), 59–80. Tainter, J. A. (1988). The Collapse of Complex Societies. Cambridge: Cambridge University Press. Van Tilburg, J. A. (1994). Easter Island: Archaeology, Ecology and Culture. London: British Museum Press. Wozniak, J. A. (2001). “Landscapes of food production on Easter Island: successful subsistence strategies,” in Pacific 2000: Proceedings of the Fifth International Conference on Easter Island and the Pacific, eds C. M. Stevenson, G. Lee, and F. J. Morin (Los Osos, CA: Easter Island Foundation), 91–102. Copyright © 2017 Merico. This is an open-access article distributed under the terms of the Creative Commons Attribution License (CC BY). The use, distribution or reproduction in other forums is permitted, provided the original author(s) or licensor are credited and that the original publication in this journal is cited, in accordance with accepted academic practice. No use, distribution or reproduction is permitted which does not comply with these terms.